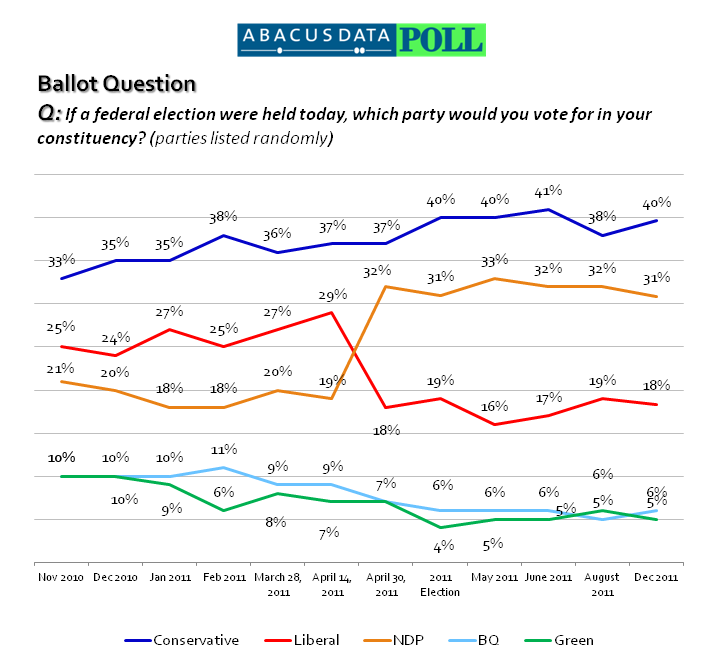 According to a new national survey from Ottawa-based Abacus Data, the Conservative Party has a nine percentage point lead over the NDP in national vote intentions. Nationally, the Conservative Party has the support of 40% of decided voters (up two since August), followed by the NDP at 31% (down one), and the Liberal Party at 18% (down one). The Bloc Quebecois and the Green Party are well back at six percent and five percent respectively. Demographically, the traditional gender gap has disappeared with equal numbers of men and women indicating they would vote Conservative. The NDP’s strongest base of support remains among younger Canadians with 41% saying they would vote NDP if an election were held today. Regionally, the Conservatives continue to do well in Ontario (43%), the Prairies (48%), Alberta (61%), and BC (46%) while the NDP strengths lie in Quebec (36%) and BC (39%). The survey also measured Canadians’ opinion about the federal government and the national party leaders. 44% of Canadians surveyed believed that things in Canada are heading in the right direction while 39% believed things are headed in the wrong track. 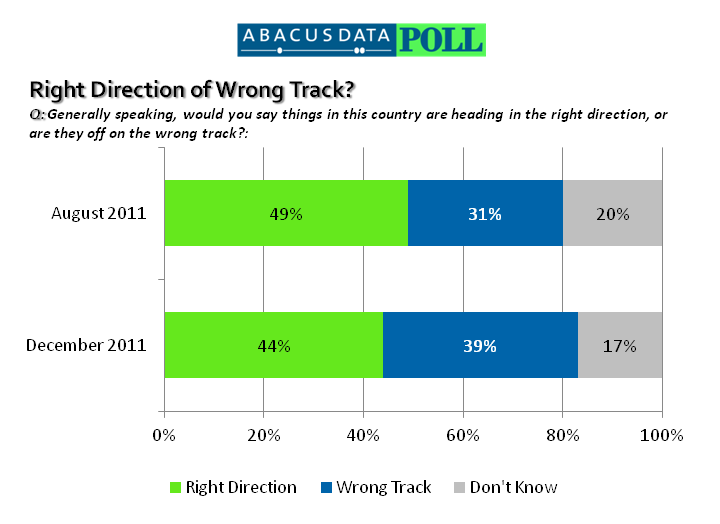 This is an 8-point increase in the “wrong track” numbers since August. 40% of Canadians surveyed either strongly or somewhat approved of Stephen Harper’s job approval as Prime Minister while 43% disapproved. Prime Minister Harper’s disapproval ratings are up 6-points since August. The Federal Government continues to get mixed reviews on its handling of the economy. Thirty-eight percent (38%) either strongly or somewhat approved while 33% either strongly or somewhat disapproved. The remaining 28% neither approved nor disapproved. Approval of how the Federal government is handling the economy is down eight percentage points since August. Stephen Harper remains the most defined and polarizing national leader in terms of personal favourability. From December 2 to 4,2011, Abacus Data Inc. conducted an online survey among 1,004 randomly selected Canadian adults from an online panel of over 150,000 Canadians. Since the online survey was not a random, probability based sample, a margin of error could not be calculated. The margin of error for a survey of 1,004 respondents using a probability sample is +/- 3.1%, 19 times out of 20.